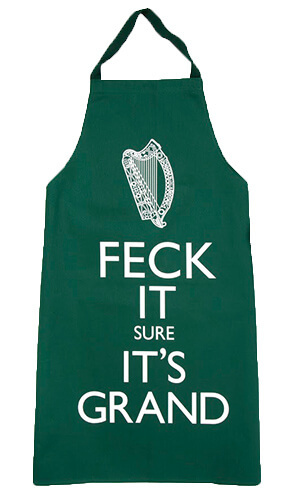 Fergus O’Neill is the graphic designer responsible for the ‘Feck It, Sure It’s Grand’ line of products. 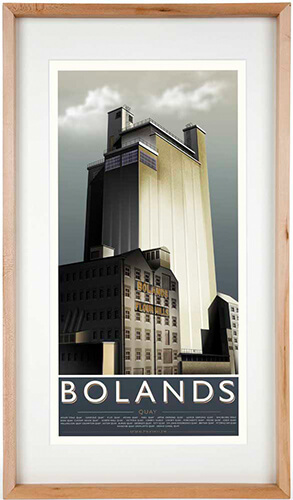 He also created a series of prints depicting twentieth-century Dublin landmarks such as the Poolbeg electricity generating station and the monumental concrete silos, now demolished, at Boland’s Mill. He studied visual communication at Dún Laoghaire College of Art and Design, now IADT, and works from a shed in Irishtown. Dublin.ie: Tell me about ‘Feck It, Sure It’s Grand’. It was in part based on the British ‘Keep Calm and Carry On’ poster, wasn’t it? Fergus: You could say I translated it into Irish. Keep Going, Sure It’s Grand. That could be the motto of the Irish. I had so many people saying: ‘that’s amazing’ – it connected with so many people. Irish people, obviously. But it connected with Irish people in a different way as well, people getting in touch asking: why are you propagating this? Why are you saying this? Some people took great offence to it, you know? Because they saw it as the feckless Irish. Diarmuid Ferriter just destroyed it – said what typified this attitude in Ireland is this poxy apron. It was really nasty. I was furious! My blood was boiling, and I was like: I’m going to find him. I just couldn’t at the time. 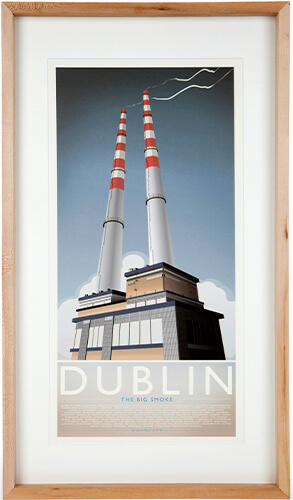 Dublin.ie: Some of your work depicts Dublin buildings in a very interesting way. Like, with the Boland’s Mill poster you capture this epic, oversized Batmanesque quality. Fergus: That’s exactly what I wanted. Since I was a kid, I’ve been brought down that end of town. Like, that end of town, that was like the end of the world. Ringsend was the end of the world. It was the end of Dublin. And even as a kid, I marvelled at Boland’s Mill. Like, all the bits and bobs that were sticking out of it. There were all kinds of chutes linking one part of the silo to another part and there were all the gangways up really high and it was just a marvellous thing to look at. And now sadly the best part of it, the concrete silo, is gone. Dublin.ie: These buildings are kind of modernistic and seen as functional and therefore seen as something you can get rid of. And yet they’re the most visually interesting elements of something like that. And you see it again. You also depict the Ballymun flats. In quite a lot of detail, right? One of the towers. Fergus: It’s based on Plunkett Tower, which was the last tower that came down in October 2015. So it almost made it to 2016. It didn’t even make it to see the centenary. And I thought it was very poignant that the project was undertaken in 1966 and it was kind of like Ireland embracing modernity and look at us, we’re able to build this city outside of the city. That was the idea. And they just bussed all of those people out from the tenements and left them on their own. I thought it was very, very poignant, obviously, in that all of the towers were named after the signatories. Dublin.ie: Dublin’s very important in your work. Tell me about what the city means to you, and your memories of the city. Fergus: I’m from Rosemount in Dundrum – a collection of two greens of terraced council houses. I used to get the bus into town with my mam, and we’d go shopping for school shoes up in Boyers. I used to love going around town like that as a kid. Being brought around by the hand. That Dublin, back then, is now like something from 200 years ago. It’s totally mad. We used to wait for the bus down in Hawkins Street. And the buses with all the smog down there. It’s just amazing that it’s only thirty years ago. It’s another world away. Dublin.ie: What’s next for you? 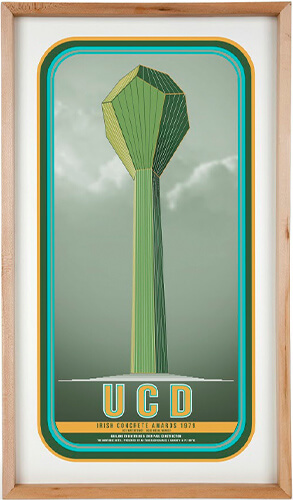 Fergus: I’ve done the water tower in UCD. A dodecahedron on top of a big pentagonal pillar. When I started looking at it, what’s really cool about it, is it won the inaugural Irish Concrete Awards in 1979. It was built by John Paul Construction onsite in seven days. It’s all shutter-poured, it wasn’t prefabricated. It’s a monument to engineering in Ireland. Find Fergus’s work at the Grand Grand website. Images courtesy of Fergus O’Neill. Karl Whitney is the author of Hidden City: Adventures and Explorations in Dublin (Penguin). A keen explorer of Dublin, his research has brought him to some unusual places – including the city’s main sewage plant and the underground tunnels through which the River Poddle flows. He has written for the Guardian, the Irish Times and the London Review of Books.